Working towards getting the Engine Exhaust Riser re-installed, materials have been arriving. We now have all of that we need to replace the riser. While working on the other ongoing project - Engine Harness replacement, we removed the Muffler from it's base in order to shift the muffler 1.5" outboard from it's current location. I removed the new Hump Hose and the Exhaust hose from the top of the Muffler, then we removed the 4 screws that secure the muffler to the plywood base. 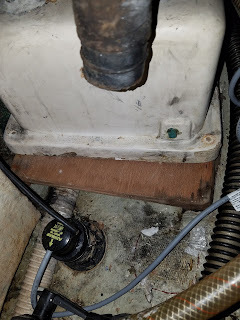 Moving it outboard (to port) requires that it goes over the bilge pump hose (the hose with the black reinforcing wires). To achieve that, I made a new base for the Muffler and planned to screw it down onto the existing plywood base but with the offset to port. Reinstalling the Muffler on the new plywood base turned out to be not so difficult. It was a challange to get to the screws in the corners of the Muffler, but a few grunts and groans and it all came together. 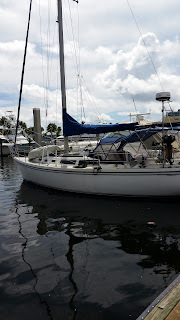 The reinstall of the hoses and the install of the new Riser will have to wait till later in the week, I want to get the electrical harness replacement complete before putting the exhaust system and the heat exchanger back into place. Hope to have the boat ready for the water by next weekend.